Today, as part of Fantastic Fables Month at Tynga’s Reviews, I’ve written an expanded version of Varik Baudelaire’s marriage proposal to Alexandra Sabian. You will only find this short story on Tynga’s site. I’m off to Mobicon 14 this weekend. I have three major workshops/panels on my schedule — and they’re all my brain-children — and two “meet and greet”s. For two workshops, I’m flying solo and the third brings in two other authors. Should be fun! Also, I’ll have a few copies of BLOOD LAW to give away and free BLOOD SECRETS swag! 12:30-1:30 — The Art of Dialogue: Speech is fluid and filled with loops, whirls, stops, and starts. Filling your characters’ dialogue with the same can instantly kill their likeability. This interactive workshop uses improvisation and audience participation to demonstrate techniques for refining your characters’ speech. 2:30-3:30 — Vampires, Werewolves, and Zombies–Oh, My! : The supernatural has branched out of the fantasy and horror genres to invade mysteries, romances, and thrillers. Why be limited to the traditional views? 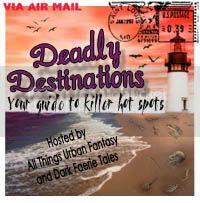 Learn to think outside of the paranormal box to fine new creatures and ways to thrill your readers. That’s my complete schedule for the weekend. I’ll be hanging out and chatting around the con. Feel free to find me and strike up a conversation. I won’t bite….or will I? BLOOD SECRETS release date change! The release date for BLOOD SECRETS has been pushed back from June 28 to July 5. Why? Several reasons but most notably is to allow for placement in the Barnes & Noble towers. Better placement = better visibility for this awesome cover = easier for you, the reader, to find it in the mad rush that will come from the anticipation of having to wait one more week! Yes, this will affect some of the events I have planned. I’m working with the various parties to resolve the issues, and hope to have updates for you soon. I received confirmation today that Carolyn Haines will be joining me at Murder by the Book in Houston, TX on July 16, at 4:30 PM and signing copies of her latest release, BONES OF A FEATHER! Two Mississippi gals loose in the Big City? Oh, yeah….it’s gonna be fun. Mark your calendars again! Join me as I conduct my FIRST blog talk radio interview with John Rakestraw. The interview will take place Saturday, April 23, at 10:30 AM (Pacific). We’ll be discussing Blood Law, Blood Secrets, books, and who knows what else. To access the interview, tune in here: http://www.blogtalkradio.com/johnrakestraw the morning of April 23. I believe the interviews are recorded so if you aren’t able to listen to it live, you should be able to check it out later. So if you’ve never heard my Southern drawl, this is your chance.